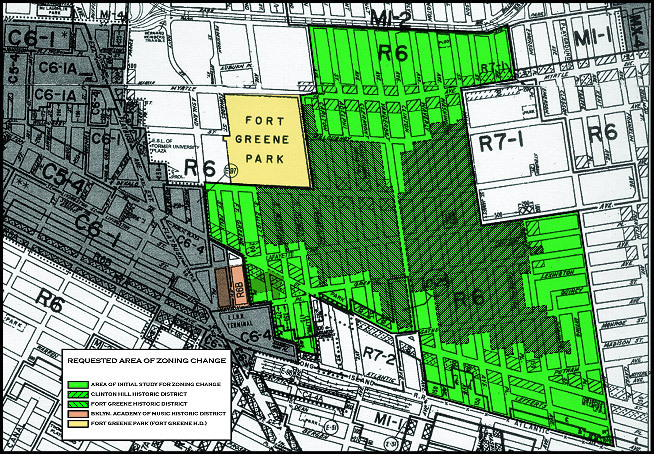 On July 25, 2007, the Fort Greene-Clinton Hill rezoning protection was approved by the City Council. The protected area includes 99 blocks of Fort Greene, Clinton Hill and part of the Wallabout neighborhoods, covering a wide expanse stretching from Atlantic Avenue to Park Avenue, and from Ashland Place to Classon Avenue. For neighborhood residents the vote of approval could not have come sooner. The main impetus for this project was the unfortunate 2002 construction of a 12-story condo tower, the Greene House, at 383 Carlton Avenue (at the corner of Greene Avenue). Despite heated community opposition the building was completed in 2003. This imposing steel and glass building dwarfs its surrounding area and is totally incongruous to the scale of the neighborhood. 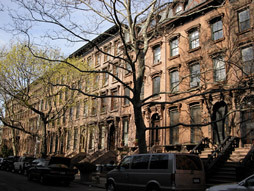 In 2002 a massive community and civic undertaking began in earnest to protect and rezone 99 blocks of Fort Greene, Clinton Hill and part of the Wallabout neighborhoods. To the project's supporters it was a necessary measure to protect our area against future out-of-scale developments like the Greene House. On the local level the proposal was driven by the Fort Greene Association, the Society for Clinton Hill, the Myrtle Avenue Revitalization Project, the Pratt Area Community Council, Councilperson Letitia James, as well as numerous other civic and local organizations. The groups and individuals donated hours of time, raised money, wrote the proposals and continually met and negotiated with the city agencies overseeing this rezoning. Over 75 volunteers from the neighborhood assisted in the surveying and cataloging of the housing stock and well as filing out the endless paperwork. The business districts in Fort Greene and Clinton Hill are also greatly benefitting from this rezoning. Before, commerical streets like Fulton and Myrtle were zoned R6, which allowed for out-of-scale structures like the Greene House as well as other even-larger new buildings. Rezoned to R7A, the commercial streets on Fulton, Lafayette and Myrtle are much more protected. Taken as a whole, the Fort Greene and Clinton Hill neighborhoods comprise one of the grandest and most vibrant residential communities in all New York City. Our old world streets include a range of notable 19th and early 20th century architecture situated on wide tree-lined blocks with nearby parks. Our enthusiasm for the area was recently shared in 2006 by TIME OUT/NY’s designation of one of our prime blocks, South Portland Avenue (between DeKalb & Lafayette) as the BEST BLOCK TO LIVE IN NYC. As neighborhood residents we are all very blessed to live in this historic oasis. Although it may seem like a long time has passed since the rezoning project’s inception, as a point of reference, the rezoning of Park Slope took over 14 years to accomplish. We are all very proud of everyone involved in this major effort and are espeically thankful that the city has taken quick steps to protect what we consider to be the one of the most remarkable and vibrant neighborhoods in Brooklyn, perhaps in all NYC. Thank you all. “Contextual Zoning” Passes NY City Council! This afternoon, the New York City Council voted into law the rezoning of 99 blocks in the Fort Greene, Clinton Hill and Wallabout neighborhoods. Known as “contextual” zoning, this new zoning law will protect the character of this truly special area for generations to come. Buildings will now need to conform to height restrictions so there are no more towers sticking out like sore thumbs (or tin cans) right next to a 4-story brownstone. Even development along the commercial corridors of Fulton Street and Myrtle Avenue will now be required to conform to height restrictions where there weren’t any before. To view details of the new zoning law, visit the website of the New York Department of City Planning. Years in the making and a top priority for the Fort Greene Association, this effort owes its success to so many people. Congratulations everyone, and thank you all. 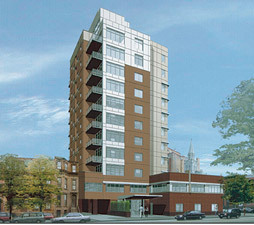 "The rezoning effort for Fort Greene, Clinton Hill and Wallabout  including the zoning along Fulton and Myrtle which is much more restrictive than the current zoning allows  has moved forward not because of any one person, but because the coalition of community groups working together, united in their desire to do something profoundly important for all the residents of the area." Table from NYC Department of City Planning website. Download their PDF here. Special thanks to all the members of all the various organizations mentioned in this article, and: Phillip Kellogg, Letitia James, Paul Palazzo, Sharon & Jim Barnes, Joan Rudershan, Peter Vitakis, Susan & Jay Butler, Ruth & Martin Goldstein, and others. ***A sky exposure plane is a theoretical inclined plane, through which the height of a building may not penetrate, that is designed to provide light and air at street level in medium and higher density districts. It rises over the zoning lot at a ratio of vertical distance to horizontal distance set forth in district regulations. A front sky exposure plane begins above the street line (or where so indicated, above the front yard line) at a specified height (from DCP). This evaluation method allowed for many of the incongruous tall towers with set backs from the street to be built in the 1960s onward (from author). For more on the Department of City Planning's terminology, read their Glossary. Click here to download or view the DCP's Proposed Zoing Map in PDF. (Right-click to save on PC, option-click on Mac). All contents copyright 2007, the South Oxford Street Block Association. All rights reserved. For more information on web design, web hosting and graphic design contact Abby.